The music of The Microscopic Septet was the sound of jazz in 20th-century America: all of it, from Ellington to Ayler, bebop to Zorn, Dixieland to experimental, captured in a microcosm. It distilled the essence of jazz as a popular music into a sound that swung, a music that was intelligent, sometimes smart-aleck, and always good clean fun. Optimistic and upbeat, full of innocent confidence, the Microscopic Septet captured not only the sound of jazz, but also the sound—or soundtrack—of 20th Century America. No wonder, then, that when National Public Radio (NPR) needed a new theme song for one of its most popular shows, Fresh Air with Terry Gross, broadcast to every home in America, it asked this band to compose the tune and has used it ever since. 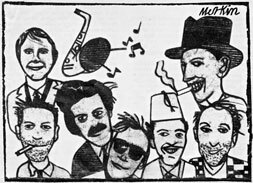 Active from 1980–1992, The Microscopic Septet was part of New York’s emerging Downtown Music Scene, a diverse group of artists on the fringes of jazz, rock, and improv that would converge in the Knitting Factory when the club opened in 1987. But while the band shared an aesthetic for breaking down genres boundaries with such other Downtown bands as Curlew, Massacre, and Material; shared the goal of creating intelligent music that could be danced to with Curlew, and shared stylistic surface elements (retro sound, stage costumes and attitude) with the Jazz Passengers and Lounge Lizards, the Micros, as the band was familiarly called, neither sounded like nor was directly comparable to any one of the Downtown bands. More inclusive than even the barrier-breaking downtown crowd, the Micros shared elements with all these bands—and more. In the ’80s, jazz purists had frozen traditional jazz forms in time, cast them in bronze, and confined them to Uptown museums. The Micros brought Uptown jazz back Downtown, where together they had a good time, broke all the rules, and spawned the smiling future of the genre. 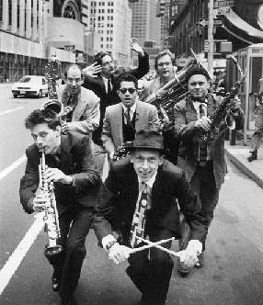 Sounding like no one else, the Microscopic Septet was the only living jazz band in 1980s/90s NYC that was playing traditional jazz—swing music—and keeping it ‘real,’ extending it into the future. Ironically, while purists feared that the Micros were undermining traditional jazz, the band had done the opposite. “Surrealistic Swing”—the music of the Microscopic Septet—was the jazz swing music of the late 20th Century. 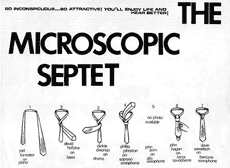 The Microscopic Septet was founded in 1980 by Phillip Johnston, a composer, soprano saxophonist, and improvisor on NYC’s Lower East Side. Largely self-trained as a musician, Johnston was influenced by a pantheon of jazz and avant-rock greats that included Steve Lacy, Thelonius Monk, Duke Ellington, Captain Beefheart, and more, as well as by popular music in myriad forms. At the time he founded the Micros, he was co-leading the Public Servants (with vocalist Shelley Hirsch), a rock band that combined pop, funk, swing, Beefheart, and avant-garde performance art, and playing in Noise R Us, a large punk/funk band with a four-sax front line. 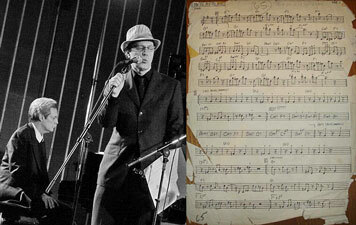 Johnston was also playing in a quartet and septet led by composer and pianist Joel Forrester. Johnston recruited musicians from these and other bands to assemble a saxophone-quartet-plus-rhythm-section jazz band. He brought Forrester on as co-leader, sharing half of the composing responsibilities. 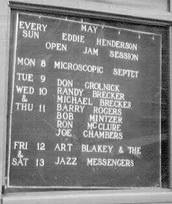 The Microscopic Septet’s first line-up also included Dave Sewelson (baritone sax; Noise R Us & Public Servants), George Bishop (tenor sax; Noise-R-Us), John Zorn (alto sax; Public Servants), Dave Hofstra (bass; Public Servants) and Bobby DeMeo (drums). By the time the band played its first show at the Lower East Side’s Ear Inn, on February 22, 1981, Richard Dworkin was in the drummer’s seat, having replaced DeMeo, and John Hagen had replaced Bishop on sax. When Zorn left to pursue an independent career, Don Davis joined the Micros on alto sax. Paul Shapiro replaced Hagen after the Micros first lp, Take the Z Train, was released. The band’s lineup remained remarkably stable afterwards. 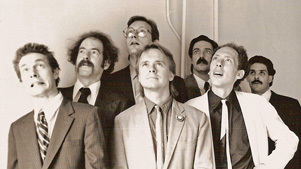 The team-up of Johnston and Forrester as the Micros’ composers proved to be magic; their compositions became the band’s stars. Called “the boldest and most gifted pair of composers to have joined forces in one group since Roscoe Mitchell and Joseph Jarman of the Art Ensemble of Chicago” [Philadelphia Inquirer], the two had known each other since the early 70s, and shared the same musical aesthetics, humor, and similarly skewed world views. They had met, says Johnston, when he was living in the Bowery, and Forrester, hearing music, barged into his apartment, unannounced: “I was playing a Thelonious Monk tune, and a guy I had never seen before came walking through my door, which wasn’t locked—those were the hippie days…” Not surprisingly, humor would play a role in the Septet, emerging in Johnston’s and Forrester’s compositions and in their onstage banter. The Micros would prove that technically sophisticated music could also be funny, and fun. A late-20th-century swing band steeped in dancehall tradition, The Microscopic Septet thrived on live performance. “We were all about playing,” says Johnston; “all we really wanted to do was have a good time and play the best music we could imagine, the best we knew how.” It played the Downtown music scene circuit—rock clubs like CBGB, Mudd Club, Danceteria, Peppermint Lounge, Studio Henry, Acme Bar and Grill and more. Later, it played the Knitting Factory and such mainstream jazz clubs as The Blue Note, as well as jazz festivals worldwide (JVC Jazz Fest). These performances attracted a devoted cult following as much for the music—technically sophisticated and played by top-notch musicians—as for the on-stage antics. The band wore suits and ties onstage, as a respectful tip ’o the fedora to Uptown’s jazz traditionalists as well as a wink to stylish New Wave rockers with skinny ties. (A poster announcing the band’s first show depicted its lineup as the seven steps to tie a necktie, and New York Rocker would later refer to them as “Seven Men in Neckties” in a review.) Like the Sun Ra Arkestra, its performances were legendary not only for musical substance, but also for entertainment value. Live renditions of one favorite tune, “Lobsters on Parade,” featured besuited Micros donning tasseled fezzes and parading through the audience. Johnston and Forrester were prolific composers; by the time the Micros disbanded, in 1992, it had a songbook of over 180 tunes. Only 34 of those were recorded and released in the band’s lifetime, in a total of 4 albums, all released on small labels to an impressive amount of high-profile critical acclaim. The Micros’ recordings received glowing reviews in big-city newspapers (New York Times, Chicago Tribune) and alternative papers (L.A. Reader, The Village Voice) on both coasts, as well as in major jazz publications (DownBeat, Cadence). Op and the subsequent Option, the bastions of hip alternative music in the ’80s and ’90s—equivalent to today’s The Wire—also favorably reviewed the Micros, as did such mainstream music publications as Musician and Billboard. Towards the band’s latter years, it was being praised enthusiastically in such widely-distributed general magazines as Interview, The New Yorker, Elle, GQ, and even Vanity Fair. The January/February 1990 issue of Option, featuring Laurie Anderson on its cover, devoted a full article to the Microscopic Septet. In 2006, Cuneiform’s four-CD retrospective of the Microscopic Septet puts the spotlight back on a band that should have never left the stage. Called History of the Micros, this retrospective was released in two parts/volumes, each containing two CDs. It contains the music on all 4 of band’s albums, and an additional 11 tracks never released during the band’s lifetime. The CD artwork was by Pulitzer Prize winning New York cartoonist Art Spiegelman, creator of the graphic novel Maus. Part 1, titled History of the Micros Volume 1: Seven Men in Neckties, covered the band’s early history, from 1980–85. It contained 2 CDs, featuring reissues of the band’s first LP, Take the Z Train; its second LP and only live album, Let’s Flip! ; and several previously unreleased tracks, including live recording done at the same time as Let’s Flip! and and the most common version (“Evil Twin”, in minor key) of Forrester’s theme for NPR’s Fresh Air with Terry Gross. Part 2, titled History of the Micros Volume 2: Surrealistic Swing, covered the years c. 1986–1990. It featured reissues of Off Beat Glory and Beauty Based on Science (The Visit), the band’s third and fourth release. It also included previous unreleased tracks from throughout the band’s career, including 2 tracks from an early recording by the band’s first lineup with John Zorn; an unreleased single with vocals by Paul Shapiro; the “Happy Twin”(in major key) of Forrester’s theme for Fresh Air with Terry Gross, and a different Fresh Air theme used during the First Gulf War of 1990–1991. To celebrate the release of History of the Micros, the Microscopic Septet reunited for a tour in November and December 2006, including dates in both the U.S. and Europe. The two double-CD sets gained stupendous praise, attention and sales, and The Micros had such a good fun on the tour that they decided to make it ‘an occasional regular thing’. Founder and co-leader Phillip Johnston desired to do a new recording; stating that “since we broke up with 180 mostly original tunes in our repertoire, I mourn the many great tunes that never got recorded.” Co-leader Joel Forrester stated that: “Going there in public didn’t call to me. But then we had this rehearsal, and I realized that the music this band plays is singular. I can’t make it with any other people.” In 2007, the Micros did a well-received, two week tour of Europe before returning to New York to record their first release in 20 years, Lobster Leaps In, released on Cuneiform. The result was another excellent opportunity for longtime Micros fans to hear parts of the band’s catalog that had remained unperformed for years. Fans and critics received the new release warmly: Jazziz Magazine said the album brought “a renewed sense of fun to the often humorless jazz milieu,” while the Village Voice called the band “the finest retro-futurists around.” With this release the Micros continued their roughly annual reunion tour. The next chapter of the Microscopic Septet’s saga springs from events which occurred before the band’s formation. As described above, in 1974, the Monk tune “Well You Needn’t” first brought the future Micros co-leaders together by chance. Johnston was living in the Bowery at the time, and Forrester, hearing music, barged into his apartment, unannounced: “I was playing a Thelonious Monk tune, and a guy I had never seen before came walking through my door, which wasn’t locked—those were the hippie days...” The encounter sparked a friendship and working relationship, in which Monk’s music reverberated on multiple levels across the years. Another chance encounter—at chicken-and-ribs place West Boondock, forged Forrester’s friendship with the Baroness Pannonica de Koenigswarter. And through the Baroness, Forrester would ultimately meet and periodically play piano for Monk. Since Johnston and Forrester’s first meeting, Monk’s music has remained an inspiration and guiding light throughout their music careers. In addition to creating and playing their own music, they always played Monk’s music with the Microscopic Septet, but due to their limited number of releases and their copious original songbook (more than 180 tunes), they only previously recorded one Monk composition. A new project would rectify that omission. Launched with the help of a fan-supported Kickstarter campaign, the Micros recorded and released original arrangements of twelve Monk tunes—half from “back in the day” and half newly-written—as Friday the Thirteenth: The Micros Play Monk. For this recording, the Microscopic Septet made clear their line of descent from Thelonious Monk. The humor and angularity of Monk’s compositions mesh easily and joyfully with the elaboration and juxtaposition of the Micros-style arranging. This was a true celebration of Monk by a group that could arguably be called his most sensitive and sensational heirs. Featuring gorgeous art work by New Yorker artist Barry Blitt (the man responsible for the infamous and controversial Michelle and Barack “fist-bump”) and liner notes by jazz critic and long-time Micros fan Peter Keepnews, Friday the 13th was surprising yet inevitable: a long overdue party with the master, at which The Micros Play Monk. Since its founding in 1980, the Micros have been responsible for some of the most captivating, memorable, and entertaining original tunes in the past 40 years of American jazz. 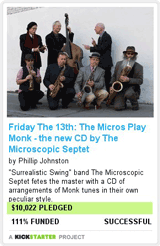 Transcending mere tribute, the Microscopic Septet’s Friday the 13th distills Monk’s heady and humorous essence, revives his iconoclastic spirit, and revels in, and with, the creative compositions of Thelonious Monk.